What do neo-communist Venezuela and Nicaragua, semi-communist Brazil and paleo-communist Cuba have in common with Islamo-fascist Iran? 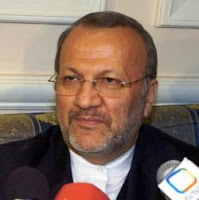 Iran's Foreign Minister Manouchehr Mottaki wound up his three-day visit to Venezuela and left for Nicaragua Saturday on the second leg of his Latin American tour. While in Caracas, Mottaki held separate meetings with Venezuela's President Hugo Chavez, Parliament Speaker Cilia Floras and Foreign Minister Nicolas Maduro. The sides discussed the latest international developments and stressed the importance of bolstering bilateral ties. Following Brazil's Deputy Foreign Minister Roberto Jaguaribe's visit to Iran, that country's foreign ministry called for expansion of relations with Iran. Jaguaribe was in Tehran on April 16 to attend the 5th political consultation meeting of Iran and Brazil. According to Iran's Foreign Ministry Media Department report on Saturday evening, Brazil's foreign ministry in a statement called for using vast potentials of Iran in bilateral relations and described talks between its deputy foreign minister and his Iranian counterpart Saeed Jalili 'useful and constructive." A forum to consider trade and investment opportunities between Iran and Cuba was held in Havana. According a report by Iran's embassy in Havana, deputies commerce ministers from both countries and around 100 people interested in trade and investment attended the forum. Iran's Deputy Commerce Minister and President of Iran's Trade Development Organization (ITDO) Mehdi Ghazanfari and Cuban Deputy Foreign Trade Minister Pedro Louis Pardon expounded on commercial situation and trade regulations of their respective countries and both expressed their countries' readiness to render services to all who are interested in trade between the two countries. Trev, I also reported of the Iranian Vice President traveled to Communist Vietnam. I believe the insurgency in Iraq are learning tactics from the Viet Cong which have retained power since U.S. forces pulled out of the region and established a domino dictatorship effect of Cambodia and Laos becoming dictatorships. I agree MAH. I think Bush is "surging" in Iraq because he doesn't want to make the same mistake that the US made after the Thet offensive. But I think Bush is getting quite bad advice from the likes of Henry Kissinger, member of the Fabian Socialist/pro-Communist Council on Foreign Relations who states the Iraq war is "unwinnable". You thought Reid's comments on Iraq were bad, well, since Kissinger has a higher position than Reid and can stay there longer since Reid can be voted out of office, that's much worse because Kissinger was an advisor to several Presidents, not just Bush but also Reagan, Bush Sr., Nixon and somewhat influence even with Carter. I also think it's quite bad that the U.S. wants to give its technology to Russia despite that Putin charged the U.S. with "supporting" the Other Russia coalition while there were Marxist orientated parties within that coalition such as the Vanguard of Red Youth which have ties to Oleg Shenin and Shenin referred Putin to a "Western pawn". You may want to give info to the blog on Once Upon a Time in the West on the Communist/far left front groups in your area as I have done with mine. Your area is just a strategic importance to Russia and China as is mine area certainly is. Jesus, not only was Saddam a life-long commie sleeper according to you Mah My Mate, so is Henry Kissinger. Wonders never cease ! Hey Man, you gotta check the statutory ingredients list on whatever it is you eat. I reckon there's some gunga concentrate hidden away somewhere in those old Kellogs you into. Each morning. Be careful Man. You are what you eat. You been sniffin' round them sewerage works again ? "Jesus, not only was Saddam a life-long commie sleeper according to you Mah My Mate, so is Henry Kissinger. Wonders never cease !" Do you even care that a 9/11 Mural was found in Iraq where Saddam was smiling quite happily about the 9/11 attacks? Apparently no. "Hey Man, you gotta check the statutory ingredients list on whatever it is you eat. I reckon there's some gunga concentrate hidden away somewhere in those old Kellogs you into. Each morning." Just more personal attacks from the ever so "tolerant" and "freedom promoter" steve. Face it, you simply just can't proclaim to be tolerant while you make personal attacks against me in this manner.